According to a statement of Press Information Department (PID), the government has already registered more than 600,000 Rohingyas, to help ease the repatriation process. It has been three months since the recent refugee crisis started in Bangladesh, as an unprecedented number of displaced Rohingyas began a mass exodus from northern Rakhine state, following a campaign of terror perpetrated by the Myanmar Army. To get an in-depth view of the current state of the refugee crisis, a Dhaka Tribune correspondent visited the Rohingya camps located in Ukhiya and Teknaf upazilas of Cox’s Bazar district. More than a hundred Rohingya men and women, who fled Myanmar after August 25 this year, were asked their opinion about returning to their homeland. A majority of the refugees stated that they are ready to go home only if the Myanmar government ensures their basic human rights and ethnic identity. Kalimuddin, 30, who left his home village in Maungdaw Township day after Eid-ul-Azha [August 27], became emotional while describing the life he had in Myanmar. “I took my wife and five children, and fled the oppression of Myanmar army and Moghs. We made a life here at Jamtoli Camp but we miss our homeland dearly,” he said. Kalimuddin firmly added that Myanmar is his country and he wants to go back but the Rohingya people’s civic rights must be ensured first. Mohib Ullah, a sexagenarian hailing from Chindiprang area of Buthidaung, said: “Bangladesh is not our country and we are Rohingya not Bangali. We are Myanmar nationals and we have the right live in Rakhine despite Myanmar government’s repeated claims that we do not belong there. “We just want to preserve our ethnic identity and our rights,” he added. Anwar Hossain, who arrived in the camp from Bolibazar area under Maungdaw Township, echoed the same. “If our Hukumat [government] agrees to accept us as Myanmar nationals and allow us to preserve our identities as Rohingya, then I will begin my journey back immediately, and will not seek compensation for the damages caused in the recent violence,” Anwar, who claimed to be a landlord in his locality, told the Dhaka Tribune. Most of the youths living in the Kutupalong Rohingya camp also expressed their wish to return home. However, Babul Miah, 55, who fled from Buthidaung’s Sherangdaung area following the unrest, is a bit pessimistic about the whole situation. “We demand that our government recognize us as Myanmar nationals. Once we achieve this, obtaining other civic rights would be a bit easier,” he said. The teenagers living in the camp, hailing mostly from Kinisi area of Buthidaung, said they are happy because they get food and shelter here, but they feel homesick and are eagerly waiting to return home. According to the Refugee Relief and Repatriation Commission, more than 631,500 displaced Rohingya entered Bangladesh in between August 25 and November 24 following the recent spate of violence in northern Rakhine state. 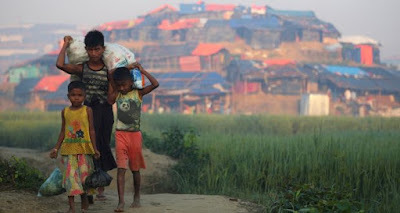 United Nations High Commissioner for Refugees (UNHCR) Senior Emergency Coordinator Louise Aubin, leading the current emergency response in Cox’s Bazar, recently stated that Myanmar is still torturing the Rohingya people. According to Aubin, this is one of the major reasons for the continuing refugee influx in Bangladesh. Human Rights Watch, on the basis of satellite images, revealed that at least 288 villages were partially or completely burned in northern Rakhine State since August 25. The Rohingya are one of the most persecuted minorities in the world. Myanmar does not recognize the Rohingya as citizens and forces them to live in camps under apartheid-like conditions. Even before the recent influx began, several thousands of Rohingyas were already living in Bangladesh since 1991.